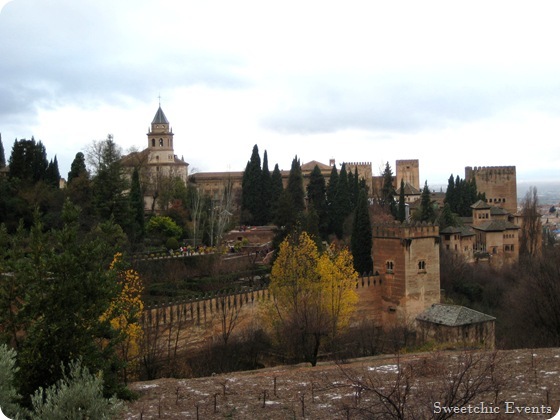 Tour of Southern Spain, Part 1 — Sweetchic Events, Inc. Happy New Year! I thought I’d start the year with a recap of our trip to the south of Spain! My parents are avid travelers, so when they asked if we were interested in joining them (and some of their friends) on a tour of Spain, we immediately jumped on the opportunity. We missed out on a trip to Italy last summer, so we weren’t going to make the same mistake twice! It was a whirlwind tour: 9 cities in 7 days! Granada, Cordoba, Seville, Ronda, Jerez, Cadiz, Gibraltar, Malaga and Madrid. We arrived at the ENORMOUS and uber-modern Madrid airport, exhausted after an 8 hour flight. It was only 8 AM in Spain, so we had a full day ahead of us! We met up with our tour group (mostly friends/acquaintances of my parents from England), and took a small commuter plane to our first city. I was surprised at the amount of graffiti that covered the walls all over Spain! The Alhambra, a 14th century Moorish palace/fortress. There were literally thousands and thousands of orange tree in every city we visited. Strangely enough, we were told that these oranges are bitter and thus EXPORTED to other countries to make marmalade, Cointreau, etc.,... and then later IMPORTED back again as the product! The Spain that lived in my imagination actually existed! A town straight out of a Grimm’s fairytale. Rows and rows of olive trees, for miles and miles and miles. Did you know that Spain is a major producer of olive oil? Borton and I in front of the roman bridge leading to the town of Cordoba. Lunch! Who doesn’t love food pictures? 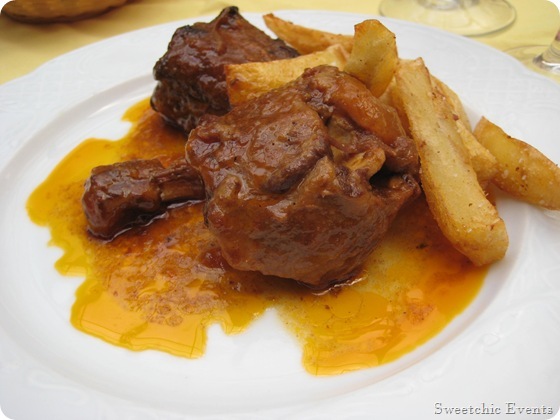 Delicious oxtail… a tad salty, but still tender. I felt cheated by the restaurant’s idea of “dessert.” But I ate it anyway (with the knife and fork!). 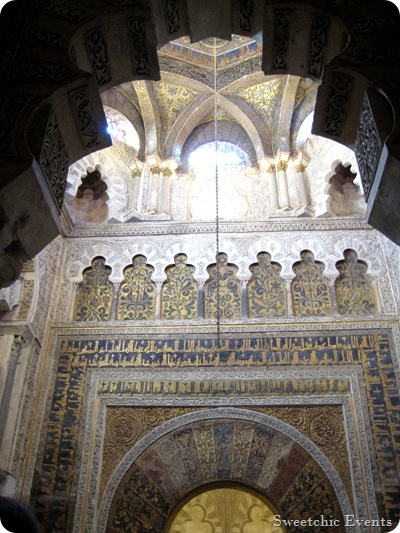 The Great Mosque of Cordoba, built starting in 600 AD. Intricate mosaics inside the Mosque. It’s amazing to think of all the man-hours that went into these massive and detailed structures! Parts of the mosque were turned into a Cathedral. 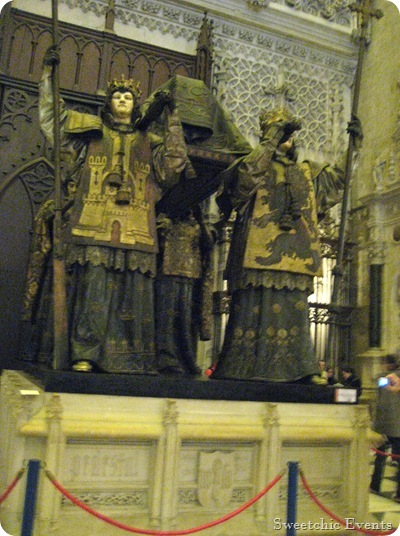 The Cathedral of Seville, the 3rd largest church in the world. The very high-tech tram system that runs throughout the beautiful and quaint city of Seville. A Flamenco show. The dancing was wonderful… but the dinner they served us was NOT, haha.